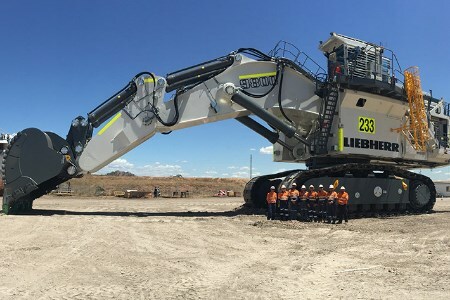 BHP has added two Liebherr R 9800 excavators to their fleet at Mt Arthur coal mine in New South Wales (Australia), commissioned in November 2018 and February 2019. Mt Arthur coal mine has been a long-term valued customer for Liebherr-Australia, and in particular the Liebherr Mt Thorley Branch. These 800 t excavators are the first of their class owned by BHP onsite, adding to the existing Liebherr fleet of two R 996B, one R 994B and 44 T 282C off-highway trucks. The two excavators took 13 000 man hours to build with a core team of 20 BHP and Liebherr technicians, with the team working night shifts for some of the final build to improve delivery times. Liebherr thanks all involved in the commissioning of these machines for their dedication and commitment to delivering the two R 9800s safely and ahead of schedule. During the build, the team’s focus also realised several opportunities for improvement, not only demonstrating Liebherr core values, but also the company’s commitment to continuous improvement of its processes.